Richard Bailey (UK), Miloslav Bednáø (CZ), Raphael Sassower (USA), Jeremy Shearmur (Australia), Friedrich Stadler (Austria), John Wettersten (Germany), Jesús Zamora (Spain). Donald Gillies (UK), Adolf Grünbaum (US), Ian Jarvie (Canada), David Miller (UK), Peter Munz †(New Zealand), Alan Musgrave (NZ), Anthony O'Hear (UK), Micheal Segre (Italy), Noretta Koertge (USA), Joanna Swann (UK). 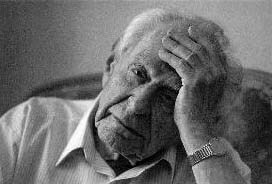 Sir Karl Raimund Popper is regarded as one of the greatest philosophers of science of the 20th century. He argued that scientific theories cannot be verified but only tentatively refuted, and that the best philosophy is about profound problems, not word meanings. He was also a social and political philosopher of considerable stature, an implacable critic of totalitarianism in all of its forms. He is best known for his vigorous defense of liberal democracy and the principles of social criticism which he considered to be inextricably linked to the functioning of the open society. In the final analysis the activities of problem-solving and criticism unify the broad spectrum of his thought. The work of Karl Popper continues to stimulate critical thought in various areas of human intellectual endeavour.